Rechargeable Receiver and EZ-Start®Batteries Included! Revo's specifications are more than just an impressive list of features. They are each specifically engineered and integrated into the model to provide capability and convenience that equates to fun! Revo 3.3's heavy-duty reversing transmission lets you easily back out of tight spots with the flick of a switch, while the OptiDrive® Electronic Transmission Control guarantees safe, smooth engagement every time. 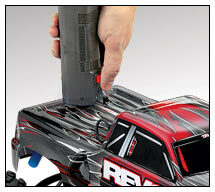 Revo engineering makes it the smoothest reversing system available on any nitro truck. The new Traxxas TQi 2.4GHz radio system features the exclusive Docking Base™, a revolutionary concept that harnesses the power of your Apple iPhone or iPod touch to create the ultimate pro-caliber radio system. The TQi™ radio system keeps you in complete control with the latest 2.4GHz technology for no-crystals-required reliability and convenience. Just switch on and drive. ­New Geode™ chrome wheels with 17mm hex hubs wear massive 6.3" Maxx®-sized tires for big ground clearance and total traction in all conditions. Revo 3.3's dual-digital servo steering system delivers 250 oz.-in of torque for powerful, responsive handling, plus they're waterproof for ultimate reliability. The new Revo 3.3 is 100% Ready-To-Drive®—even a fuel dispensing bottle and rechargeable NiMH packs for the receiver and EZ-Start system are included, along with the chargers, extra oil filter, extra glow plug, precision tool set, and more! All the race-engineered advantages that make Revo a seven-time national champion on the track also make it the ultimate platform for all your monster truck fun. 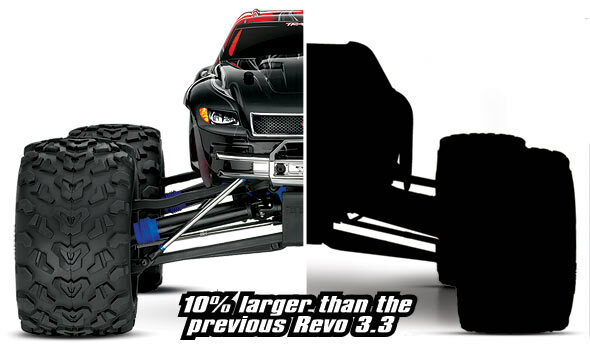 Revo durability is second to none, once the long travel rockers are installed, Revo has the most suspension travel of any monster truck. Revo 3.3 is equipped with the world's most advanced Ready-To-Race® radio system. 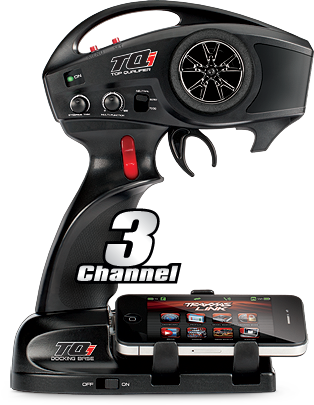 The all-new Traxxas® TQi™ radio system with Docking Base turns your iPhone® or iPod touch® into a powerful tuning tool. The device display combines with the Traxxas Link™ App to deliver an intuitive, high-definition, full-color graphical user interface that optimizes your radio system for ultimate vehicle control. Automatic model recognition instantly recalls your settings for up to 30 Traxxas Link-enabled models—just switch on and drive. This powerful App gives you complete control over the operation and tuning of Revo 3.3 with an intuitive, high definition graphical user interface. Once you have created the perfect control settings for your model, you can save them as a profile that you can restore later, use on another model, or share with friends. Traxxas Link telemetry sensors (sold separately) transmit real-time data including speed, RPM, temperature, and battery voltage with stunning visuals. TQi Docking Base is compatible with iPhone® 3G/3gS/4/4S and iPod touch® 2nd/3rd/4th generation. 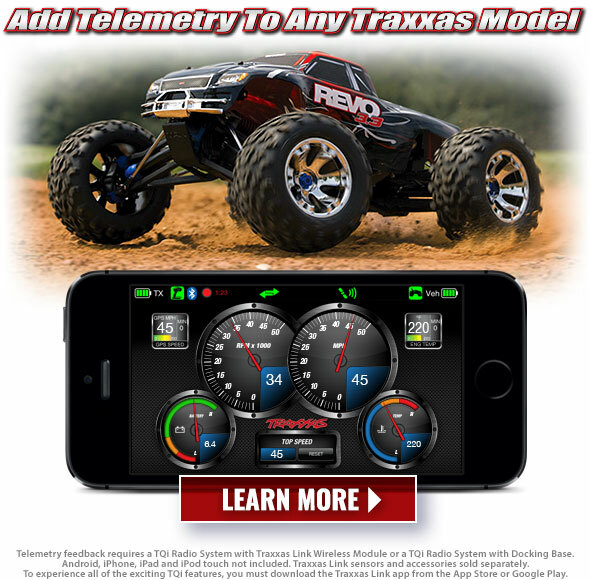 When you add optional telemetry sensors (sold separately) to your model, Traxxas Link collects and records real-time telemetry data as you drive. The Traxxas Link dashboard comes to life showing you speed, battery voltage, RPM, and temperature. 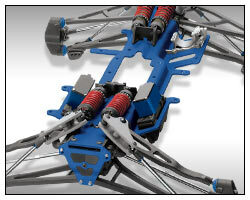 The application automatically detects and recognizes Traxxas Link sensors for easy set up and configuration. The dashboard is fully customizable with either dial or digital readout gauges. Up to nine gauges can be displayed at once. Set threshold warnings and log maximums, minimums, or averages. Use the recording function to document your dashboard view, with sound, so that you can keep your eyes on your driving and not miss a single apex. If you forget to record, simply touch Instant Replay anytime to capture the previous minute of fun and unexpected triumphs. The recordings can be named, saved, and shared with others. The new Revo 3.3 is a full inch wider with an even more aggressive, high-riding monster stance thanks to new Geode™ wheels and massive 6.3" Maxx-sized tires. The rugged all-terrain treads have wrap-around lugs to give Revo 3.3 trail-shredding traction, and the wheels' extra offset ensure a sure-footed feel no matter how tough the terrain. Blue-anodized 17mm hex hubs with Traxxas' exclusive splined design guarantee every powerful stroke of Revo's class-leading TRX 3.3 engine is channeled directly to the wheels. The Geode wheels' durable show-chrome finish helps you look your best when you're at the front of the pack. That's all you need to go from the box to the backyard with the Revo 3.3—4 AA batteries for the transmitter, and Traxxas Top Fuel® Power Plus™ to pour into the tank. 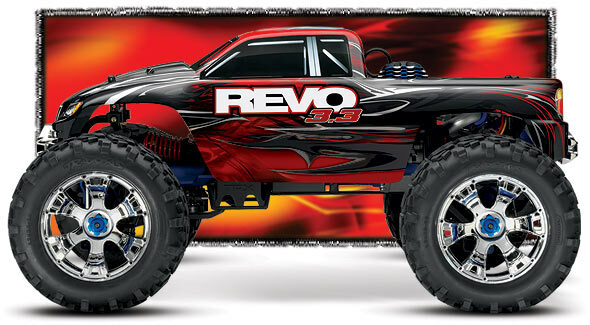 The Revo 3.3 is fully assembled, with pre-glued tires, a mounted and trimmed ProGraphix body and dialed-in electronics. But we didn't stop there; a high-quality 5-cell NiMH receiver pack AND 6-cell EZ-Start battery are included, each with its own charger. A 500cc fuel bottle is also included for fast fillups, and there's even a spare glow plug and air filter element to keep you running strong. A precision metric specialty tool set is also included for easy servicing. 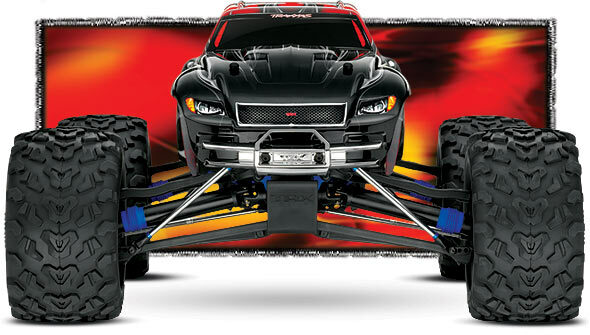 Everything you need to experience nitro monster fun the Traxxas way is in the box. When it comes to sheer power, high-rpm performance, and reliability run-after-run, no engine can even come close to the award winning TRX® 3.3 Racing Engine. 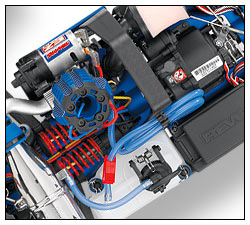 This precision-engineered powerplant is the solution that brings it all together with extreme horsepower that is second to no one; easy tuning; full Traxxas reliability and support, including the Lifetime Engine Replacement Plan; and the pure convenience of one-touch, push-button, EZ-Start electric starting. Only the Traxxas EZ-Start® offers the pure convenience of true one-handed operation and complete on-board, push-button electric starting. 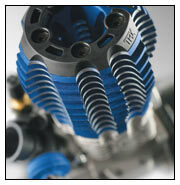 EZ-Start is the safest and most reliable way to start your engine. The Traxxas EZ-Start lights your glow plug and starts your engine quickly and smoothly at the push of a button. Traxxas' exclusive Smart Start® technology monitors critical starting functions, automatically sensing and diagnosing potential problems for trouble-free engine starting every time! Once you've used EZ-Start you'll wonder how you ever enjoyed a nitro engine without it—and with Revo 3.3's included EZ-Start battery and charger, everything you need to enjoy electric starting convenience is right in the box. Ready-To-Drive® with included NiMH receiver pack and EZ-Start battery, chargers, fuel-filler bottle, spare glow plug, precision tools, and more!